A television set or television receiver, more commonly called a television, TV, TV set, or telly, is a device that combines a tuner, display, and loudspeakers for the purpose of viewing television. Introduced in the late 1920s in mechanical form, television sets became a popular consumer product after World War II in electronic form, using cathode ray tubes. The addition of color to broadcast television after 1953 further increased the popularity of television sets in the 1960s, and an outdoor antenna became a common feature of suburban homes. The ubiquitous television set became the display device for the first recorded media in the 1970s, such as Betamax, VHS and later DVD. It was also the display device for the first generation of home computers (e.g., Timex Sinclair 1000) and video game consoles (e.g., Atari) in the 1980s. In the 2010s flat panel television incorporating liquid-crystal displays, especially LED-backlit LCDs, largely replaced cathode ray tubes and other displays. Modern flat panel TVs are typically capable of high-definition display (720p, 1080i, 1080p) and can also play content from a USB device. During the first decade of the 21st century, CRT "picture tube" display technology was almost entirely supplanted worldwide by flat panel displays. 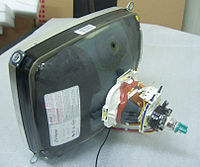 By the early 2010s, LCD TVs, which increasingly used LED-backlit LCDs, accounted for the overwhelming majority of television sets being manufactured. ^ Pierce, David (25 November 2018). "Your Smart TV Is Only Going to Get Dumber". The Wall Street Journal. Retrieved 27 November 2018.